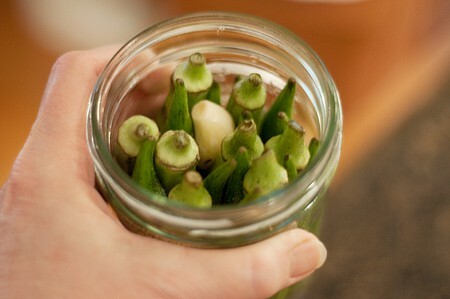 Here’s another little bit of southern deliciousness for you today – Pickled Okra! You know how I enjoy canning in the summer. I almost always make some Strawberry Jam and our favorite Kosher Dills along with a good Basic Salsa recipe. We’re already enjoying all of those this year. I still need to make a few jars of my Sugar Free Bread and Butter Pickles and might even have to make a few more jars of the kosher dills if I can get my hands on any pickling cukes this late in the season. But I can’t let the summer end without sharing my recipe for Pickled Okra. This is my personal favorite. I’ll breeze right by a dill pickle if there’s pickled okra around. I love it with a sandwich or just as an accompaniment to some good, old-fashioned southern vegetables. It’s also a great addition to an antipasto platter. When I get ready to make pickled okra, I hand select every pod for the recipe. Really. I literally stand there in the produce aisle or the farmer’s market and choose every single pod. I want them to be young, tender and no longer than the depth of a pint jar. It usually takes between 1 1/2 to 2 pounds to make three pints. You’ll have to use your cook’s judgment based on the okra that is available to you. If you have leftovers, so much the better! Slice it, dredge it in some cornmeal and fry it up! Start by preparing the jars, rings and lids according to standard canning procedure. If you haven’t canned before, or if it’s been a while since your last canning session, please review the process and get all your equipment ready before you start. One of the best resources for new and seasoned canners alike is the Ball Blue Book. It’s published by the people who make the Ball canning jars. It’s available in lots of locations and on the web at amazon.com. The National Center for Home Food Preservation even offers a free online course in food preservation. It’s well worth the time for the amount of information you get! My recipe makes three pints. Feel free to double it if you want more! 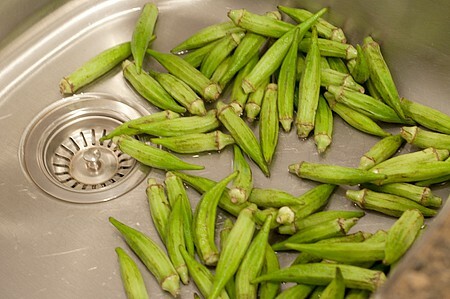 Wash the okra in cold water. Trim the cut ends only if necessary. Get your spices ready. You’re going to need canning salt, dill seed, whole peppercorns and garlic cloves. Peel the garlic, but leave it whole. Umm…can you just pretend that there is some salt in that photo? It was sitting off to the side…oops. 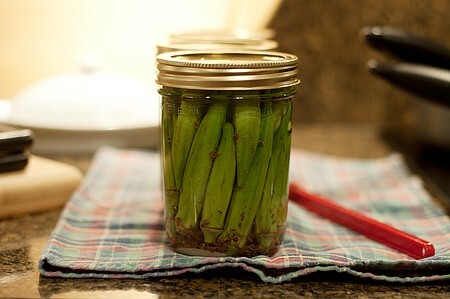 Into the sterile jars, pack as many pods of okra as possible with the tips pointing up. To each jar add 1 teaspoon of canning salt, 1 whole garlic clove, 1 teaspoon of dill seed and 1/4 teaspoon of whole peppercorns. 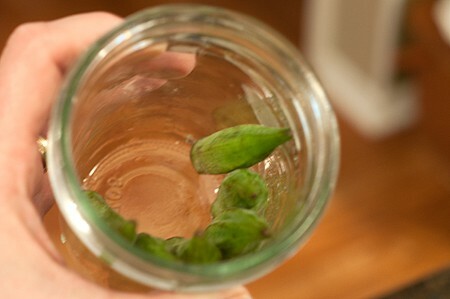 Finish packing the jars as fully as possible with additional okra, tips down, fitting the pods in tightly but taking care not to crush the okra. Bring the vinegar and water to a boil. Fill jars with the vinegar and water mixture to within 1/4 inch of the rim. Place the lids and rings on the jars and process in a boiling water bath for 10 minutes. Remove the jars from the canner and allow them to cool completely. Notice the difference in color after they come out of the canner. The okra has taken on a beautiful olive green color. Let the pickles sit for about a month to achieve the best flavor. Prepare jars, rings and lids according to standard canning procedure. To each jar add 1 whole garlic clove, 1 teaspoon of canning salt, 1 teaspoon of dill seed and 1/4 teaspoon of whole peppercorns. Finish packing the jars as much as possible with additional okra, tips down, fitting the pods in tightly but take care not to crush the okra. Bring the vinegar and water to a boil. 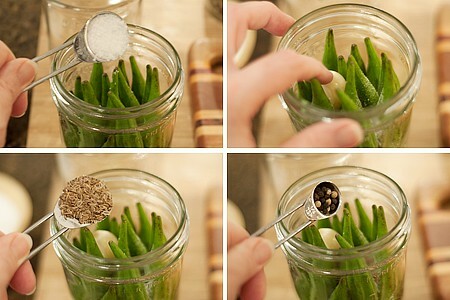 Fill jars to within 1/4 inch of the rim. Place lids and rings on jars and process in a boiling water bath for 10 minutes. Remove jars from the canner and allow them to cool completely. Thank you, Tien. Maybe you’ll try making some homemade pickled okra now? I love pickled okra. When I lived in the south I had it in my fridge at all times. When I moved back to New England no one heard or had had it. I couldn’t find it till one day I was at a store that every once in awhile had an off item. Lo and behold there was a few jars. I was doin the happy dance. Since then been without looking to purchase online. I housebound so getting ingredients and making is near imposible for me. When/if I can I will make. Thanks for shareing recipe, I hope to be able to make it and share and enjoy. I’ve never ever cooked with okra or done anything with it, really. I do love dill pickles, though, so maybe I’d love these even more! They are really very good. Great with a Bloody Mary! 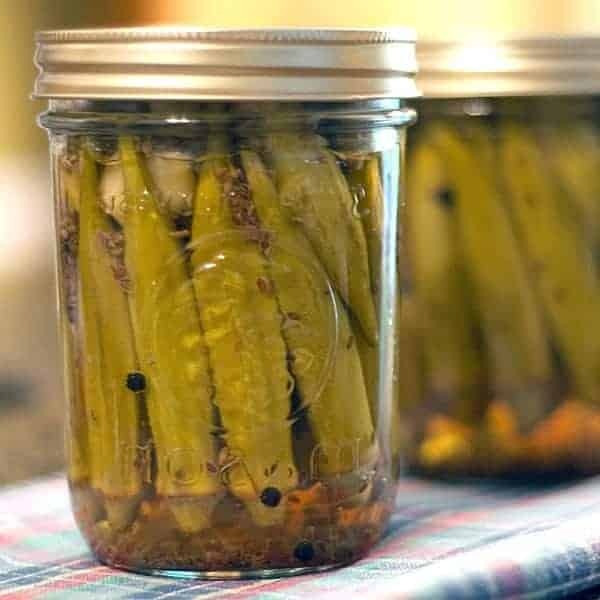 I will admit that I have never tried pickled okra, but from your description (and the fact that they are pickled – can’t resist), I’m sure I would love these. Lana, great pickle recipe. I am a big fan of okras whether they are grilled, pickled, fried, or any other method of cooking them. Oh, yum! I’d love to get a jar of these babies and would be happy to trade my favorite, flash-sauteed (non-slimy) Indian-spiced okra recipe. Deal? Bookmarked for later in the fall when my garden okra starts producing. Can you believe I have never had okra? That’s right, I haven’t! but these look pretty tasty I must admit! I’ve had these before and loved them, but have never made any myself, looks so easy! It is easy, Angie. I hope you’ll give it a try! I had been in search of pickling recipe since I saw the last night tv show Unwrapped. Your looks the best and easiest. Thanks Lana. By the way do you have any recipes for canning fruits like peaches. Thank you in advance. I do have recipes for canning fruits, but they’re not on the blog. Maybe next summer I’ll do a series of posts on those! Oh and also Pickled okra that is new for me I gotta try it. I always grow okra in my garden, and I usually just fry it or cook it with tomatoes. 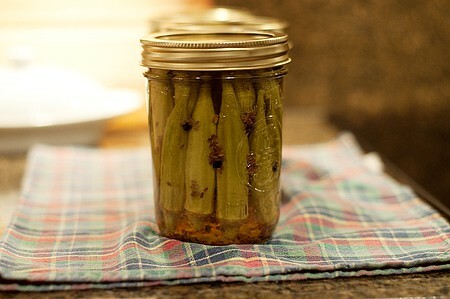 I love pickled okra, but have never made any. This recipe is so easy and delicious! Thank you! Just wondered if it’s okay to use fresh dill instead of dill seed? Sure! 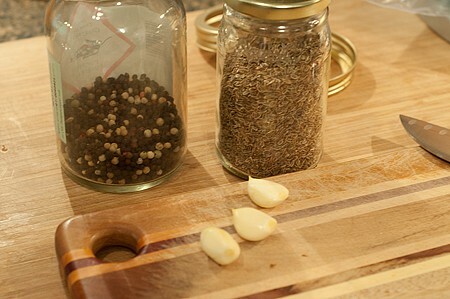 The normal substitution is three heads of fresh dill for each tablespoon of dill seed. Yes, I love, love, love pickled okra. But then I like it raw, boiled, steamed, fried, pickled or just about any other way……. I was looking for a good old fashioned teacake like my grandmother made, and so hope I’ve found it. I can still smell them cooking. Just like you said, it takes you to another place. My mother and her family are from Waycross, GA so I hope the recipe will be similar……I’ll let you know. Thanks for both recipes and I have book marked your blog. I’ll be back as they say! Thanks for sharing…….I deal with food allergies, so always cook my own goodies!!!! gloria g. – now in Hemingway, SC southern to the bone! I also love pickled okra but as a transplanted Southerner now living in the Canadian Rockies, this is not an item I can easily find on the grocery shelf! My father and grandfather are from Morgan County, Georgia and I remember as a child my grandmother making pickled okra. Finally saw some baby okra at my nearby Asian store while shopping for catfish today and my taste buds started thinking of the treat from my childhood. Baby okra is now chilling in my fridge awaiting transformation tomorrow morning. My catfish was grilled on the BBQ tonight, but served in true Southern fashion with cheese grits and Southern Ice Tea to a few neighbours and my family. Neighbours thought Southern cooking was quirky but they all wanted the recipes for everything! My children, though first generation Canadians, have grown up with a mixture of Southern and Canadian cooking and I am proud to say they are better Southern cooks than I am! Thank you for this easy to do recipe. You’re welcome, Sam! I hope you enjoy your okra pickles and the Georgia BLT as well! Just made 6 pints…I cant wait!!!! My family loves pickled okra. I cannot make enough. I have pickled at least 80 pints so far. I children, 8 to 15, eat a pint jart each night and they fight over who gets the garlic clove. I really think that is why they are never sick. I love pickled okra, always have. Just never new how to do it. Thanks to you, I don’t have to pay those high high prices in the stores any more. I can just head to the basement and pull out a jar. I’m considering making some to give away as Christmas gifts. Do you think the packaged okra that you find in the grocery stores would work well? Yes, you could use fresh okra from the grocery store. Just make sure it’s young and tender, not woody.